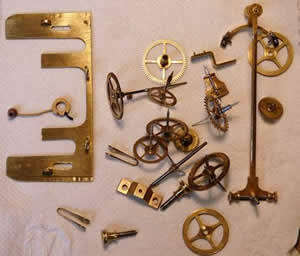 The movement was very good quality and shows very little signs of wear. All the steel work had a high polish and shows no sign of corrosion. There have been no significant repairs to it although it clearly has been stripped down and cleaned before. the construction of the face does not have the same quality as the movement but I don't doubt that it is original. It was a pity about the original mahogany pendulum that had been broken and glued together with araldite. The break was at the longitudinal slit and brass insert that takes the impulse from the the crutch. The pendulum rod was also quite a bit bowed so that it tended to wobble. The replacement pendulum rod I bought was made of beech rather than mahogany, as in the original, but it stained up fairly well. I used the original brass insert to take the impulse from the crutch. 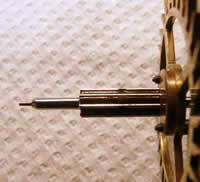 Escape wheel showing some sigs of wear. 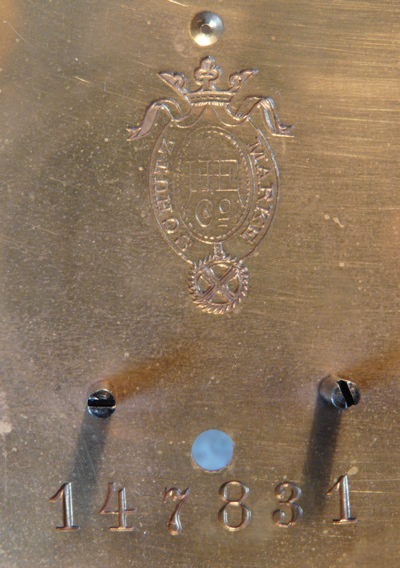 Detail on the back plate. “Schutz Marke” means trade mark in German although I cannot find out any information on what company the trademark belongs to.